This is my first time watercolour blending both red and purple to create a two-toned flower. I'm happy with how it turned out. Of course, I got a smudge of black at the top left and didn't realize until after I finished watercolouring!! :) So I fussy-cut the flower and stems, leaving a thin white border. Then I popped up the flower heads for dimension and glued the bottom of the stems under a sentiment banner at the bottom. A few sequins add sparkle ... Izzy is all about the bling! :) I took my white gel pen and went over the lines of the stamens to make them stand out more. Your blending is gorgeous, Loll. Great idea to pop up the flowers. beautiful - looks like a winner to me! Love the colors as we move toward Fall. You are so good with color. Two things struck me about this card. First, you should be thrilled with the fabulous way you watercolored these! Awesome color blending. The second, I'm in awe that you were willing to fussy cut that! Just amazing and so perfectly done. This is an incredibly beautiful card for his friend! Izzy will love it! The colour blending of the red and purple turned out perfectly. Great fussy cutting and layout! Beautifully watercolored. Love the colors. Izzy is going to love it too. I love the way your colors turned out! This set is a favorite of mine and it's been several weeks since I got to use it. Thinking I need to get it out again! These flowers are GORGEOUS, my friend! I can't imagine that Izzy wouldn't love this card! I love the extra dimension of the cut out flowers and how you tucked the stems under the sentiment strip! An AWESOME card! Gorgeous card Loll. Amazing and beautifully coloured image. Love the white stamens. Fantastically gorgeous as always, Loll. I try to emulate your cards in a similar manner......they look nothing like yours at all, haha. But you inspire me with every posting! Thank you! 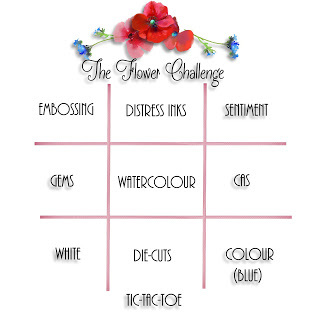 Oh Loll this is so beautiful - love your watercoloured flowers and how you saved all that work!! The flowers look so delicate popped up like that. Your watercoloring always amazes me! The red and purple blended together is smashing. And your save with the fussy cutting gets a gold star for patience (smiley face). Another beautiful card with just the right touches. 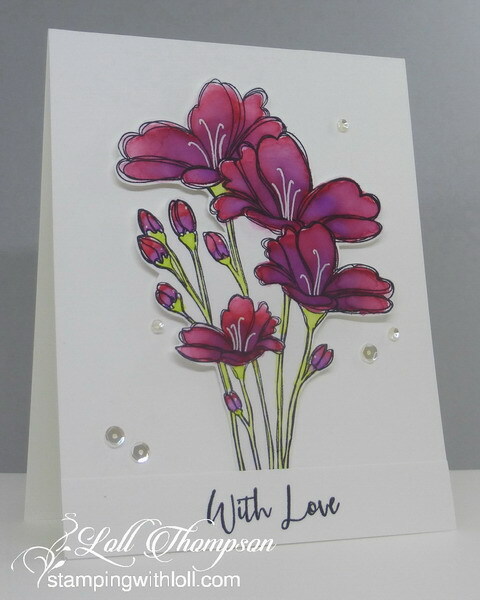 what a beauty mf...love how the cut out flowers add interest to your great cas card....sure she will love it. Gorgeous work, Loll. That color blend is phenomenal. Oh my goodness, what a lucky gal! I'm sure she will adore this card. Wow!! Hugs! What a lovely color from your blending! She will love this. Those blended flowers look fantastic! You are a very patient woman if you fussy cut all those stems...! Love this card! I like this birthday card,the flower on top giving fantastic look.Thanks for sharing this post. Oh! This is gorgeous! Watercoloring is truly my favorite. You blended your colors beautifully! I can hardly tell you fussy cut but it does show some dimension, which is fabulous. Love this image standing out so crisply on the white card base. All your cards are amazing. I need to visit more often. So many blogs, so little time, sigh... Thanks for taking the time to stop by my blog, Loll! I had no idea that Wilted Violet and Candy Apple could blend for such a gorgeous result! 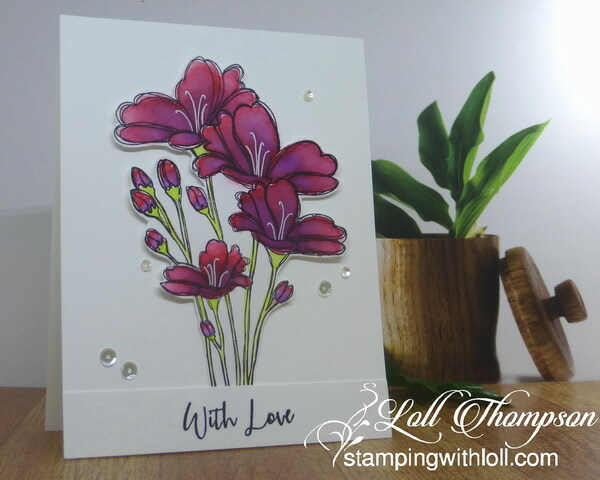 Your flowers are absolutely stunning, Loll and I love how you added details to the stamens ~ Izzy is going to LOVE this card, for sure! Such a beautiful color combination, Loll. Red is a component of purple so it must work together and the effect is great. I love the extra dimension in the card. White stamens are a great idea, flowers have been very animated. The purple and red blended together beautifully, Loll, but I can't imagine fussy cutting all those little stems. Your braver, and more talented, that I am. Beautiful card, Loll! I love the rich blended colour of the flowers and how you've popped the flower heads up for dimension. Great save!! 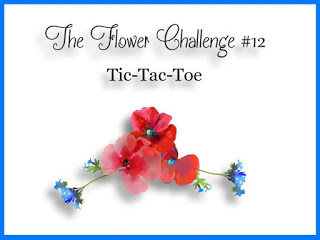 I am so glad that your card has won the challenge of The Flower Challenge. It's such a beautiful card and very well deserved victory. Congratulations!